Cable Connector which is often referred to as sockets, electrical plugs, stop contact, electrical connectors or electric connector is a conductive tool to combine electric circuit together. The connection may be temporary, such as for portable equipment, or may require tools for assembly and termination, both for electricity permanan between two devices using the power cord. 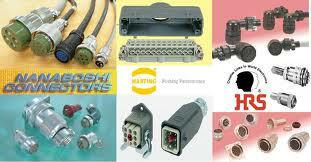 There are many types of elctrical connector used in many types of industrial manufacturing, industrial automation, transportation industry, medical industry, industrial computerized telecommunications industry or capable of being used to send and receive data. Type and connector models are widely used in the industry is a heavy duty connectors either circular or rectangular shape. Brand the most commonly used in the industry is Harting Connector, becuase Harting connector has a fairly broad variants both in terms of type and application. For Brand From Japan that is commonly used in the industry is of Nanaboshi and Hirose connector but some of JAE connector. 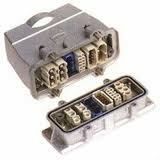 Type connector of Japanese bands like Nanaboshi connectors include: NCS, NJW, NWPC, .NET, NEW, NR, NRW, .NET, NMI, and other NHVC. Shape of Connector nanaboshi is entirely circular connector. 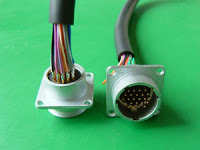 Nanaboshi Connector basically consists of a plug and receptacle connector Connector with application installation where the receptacle connector is always mounted on the panel of machine. Even for special applications there is also a connector explosion proof from Sibas connector.